What Is the Best Cleanser for Acne? While there are several cleansing options out there that can be very effective at clearing active acne and preventing new pimples from forming, it is crucial that you choose the right product based on your skin type. This article will explain the differences between treating acne for dry and oily skin types, as well as recommend some of the best cleansing options for each type. Step 1: Is Your Skin Dry or Oily? Since both dry and oily skin types can struggle with acne, the first step to getting clear skin is to determine which type you are. One way to do this is to find a Skin Type Solutions physician partner in your area who can give you access to the Baumann Skin Type Questionnaire. This quiz, which only takes a few minutes to complete, will take the answers you provide about your skin history and lifestyle habits to determine which of the 16 Baumann Skin Types® you are. There are eight dry skin types and eight oily skin types. Once you know which of these categories your skin falls into, you can move forward with the process of choosing the right acne-fighting cleanser. What Are the Best Acne Cleansers for Dry Skin? Some of the most common medications for acne include salicylic acid—a type of beta hydroxy acid—benzoyl peroxide, and other antibacterial ingredients like silver and sodium hypochlorite. By reducing P. acnes bacteria, the type of bacteria that causes acne, these ingredients can help to clear your skin. However, not every antibacterial ingredient is appropriate for dry skin. Benzoyl peroxide, for example, can be very irritating for people with dry or sensitive skin types. Similarly, although salicylic acid can clear your pores, this ingredient can be drying and is therefore not typically well-tolerated by dry skin types, especially if you are using a retinoid as well. Instead of relying on ingredients that can cause more dryness and irritation, dry skin types typically do best using an alpha hydroxy acid (AHA) cleanser, such as Essopi Glycolic 10% Moisturizing Cleanser. Glycolic acid, a type of AHA, acts as a humectant—meaning that it is able to pull high amounts of water onto the skin’s surface. AHAs also promote exfoliation, which helps to prevent clogging of the pores. Glycolic acid has a low pH, which makes it more difficult for the acne-causing bacteria known as P. acnes to live on your skin. When you are using acne medications such as retinoids, AHAs may be too strong to use twice a day. For this reason, use your AHA in the morning. At night, dry skin types should choose a gently creamy cleanser to remove makeup and other debris from the skin’s surface. Never use a foaming cleanser if you have dry skin, as these products contain ingredients that remove oil from your skin. What Are the Best Acne Cleansers for Oily Skin? Oily acne-prone skin is easier to manage than dry, acne-prone skin, for the simple fact that oily skin types can tolerate most acne medications better. For oily types, use a salicylic acid cleanser at least once daily to unclog pores. Salicylic acid also has strong anti-inflammatory properties, which help to prevent the formation of new acne lesions. If you are also using benzoyl peroxide or retinoids, using salicylic acid twice daily may feel too drying. If this is the case for you, switch to a foaming cleanser in the evening to remove makeup and dirt. Going to bed without removing these particles from your skin can make acne worse. Foaming cleansers are appropriate for oily skin types because they help to remove some of the excess oil from your skin. People with dry skin need more oils on their skin, which is why foaming cleansers are only recommended for oily skin. Before choosing a cleanser for acne, you will need to know if your skin is dry or oily. However, many people are unable to correctly assess this aspect of their skin type. 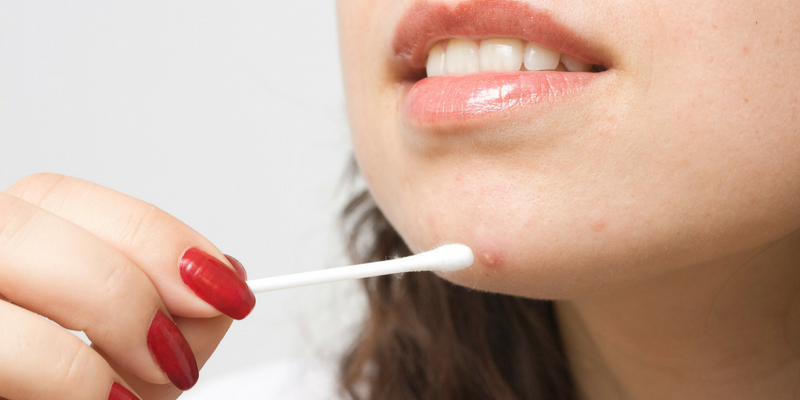 If you’re not sure what your skin type is, it is best to consult a board-certified dermatologist to be sure you are treating your acne-prone skin with the right medications and ingredients. For more information on how to cleanse your skin and for other skin care tips and advice from Miami dermatologist Dr. Leslie Baumann, follow Baumann Cosmetic Dermatology on YouTube, Facebook, and Instagram!